841 G. FALCONER & CO, HONG KONG. 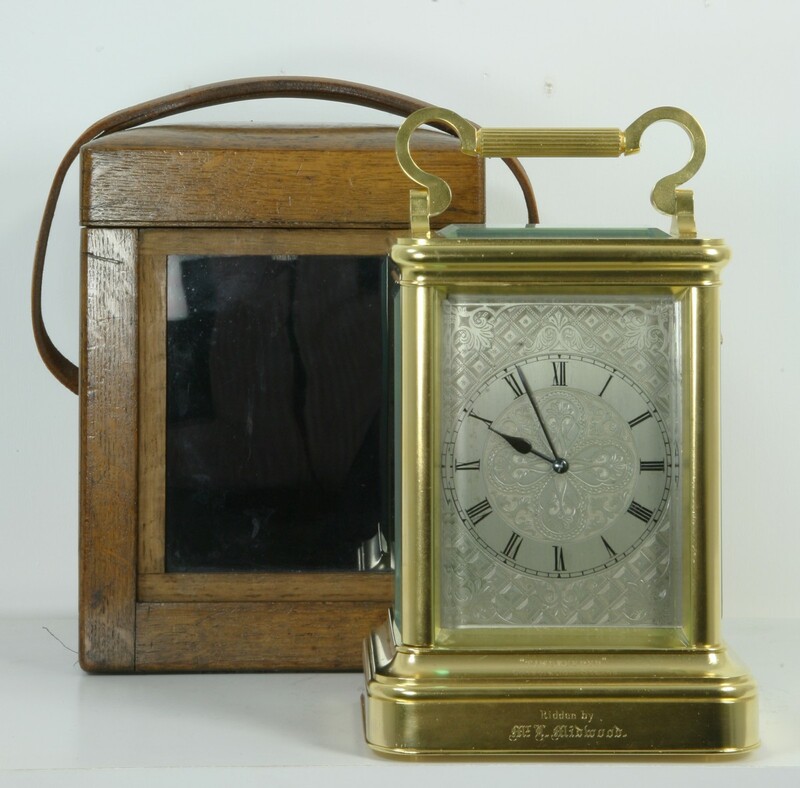 A FINE QUALITY GIANT ENGLISH FUSEE STRIKING CARRIAGE CLOCK WITH ITS ORIGINAL OAK TRAVELLING BOX AND KEY, WITH FASCINATING PROVENANCE FROM THE HONG KONG JOCKEY CLUB. CIRCA 1890. 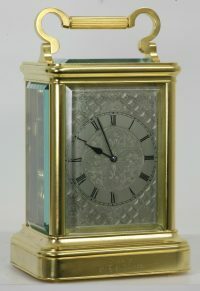 A fine quality English fusee carriage clock, the case of simple elegant proportions, similar in style to the French corniche case, has a curled handle with a reeded centre. 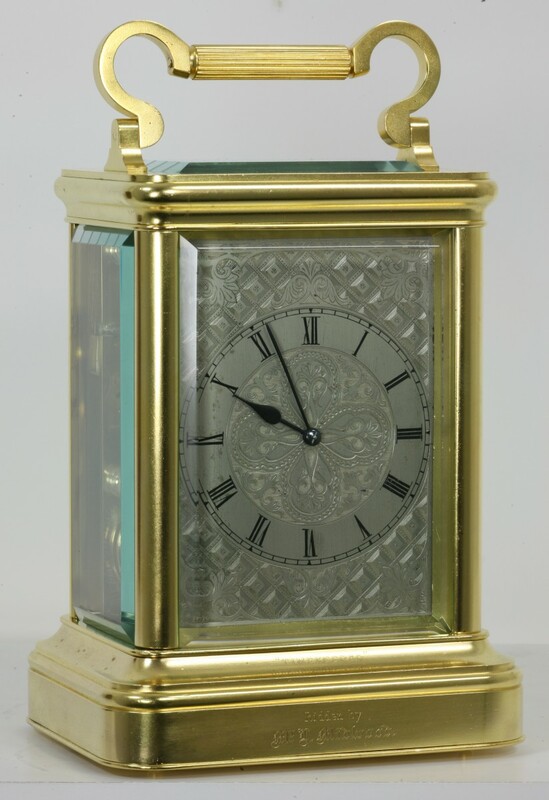 It has a gilded shuttered rear door and deeply bevelled glass to the top, both sides, and the dial. 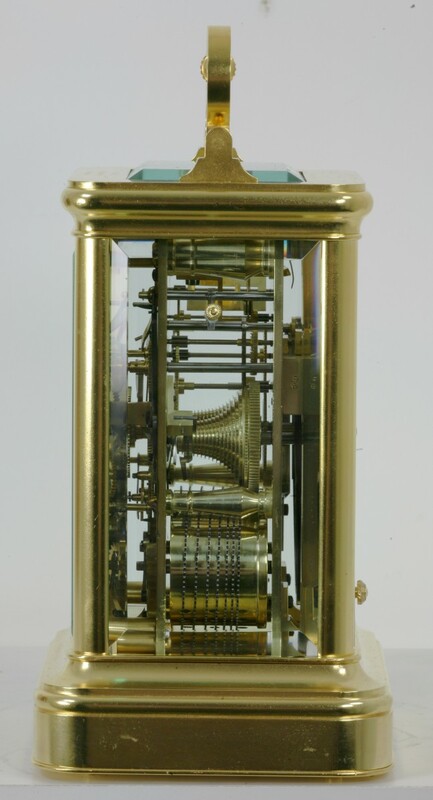 The dial is a particularly nice feature with fine engraving to the silvered brass. The engraving outside the chapter ring is of geometric design with foliate scrolling. The engraving inside the chapter ring is of foliate form with stylized engraved ovals. The chapter ring has Roman numerals with blued steel spade and pointer hands. The strike repeat button comes through the side glass. 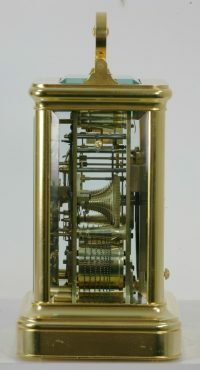 The eight day twin chain fusee movement is of the finest quality and was almost certainly made for Falconer by one of the top English makers. The pillars are reminiscent of work by Frodshams. 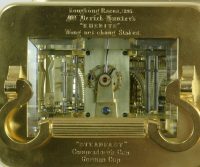 It has a split bi-metallic balance wheel for the lever escapement with poising screws which can be viewed through the top glass. It strikes and repeats the hours on a gong mounted on the backplate. The backplate has a signature cartouche engraved at the bottom with ‘G. Falconer & Co, Hong Kong’. The oak carrying case is unusual. It has a domed top, similar to those found on leather carrying cases, with a removable slide over the front glass. Rather than a lock, it has two latches to the top and a substantial leather carrying handle fixed into the side of the case via brass plates. 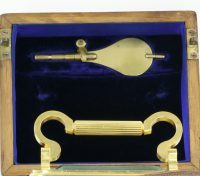 The interior of the box is lined with blue velvet with a cut-out in the lid to house the original key. The maker or retailer George Falconer is noted as working in Hong Kong from 1872 until 1921. 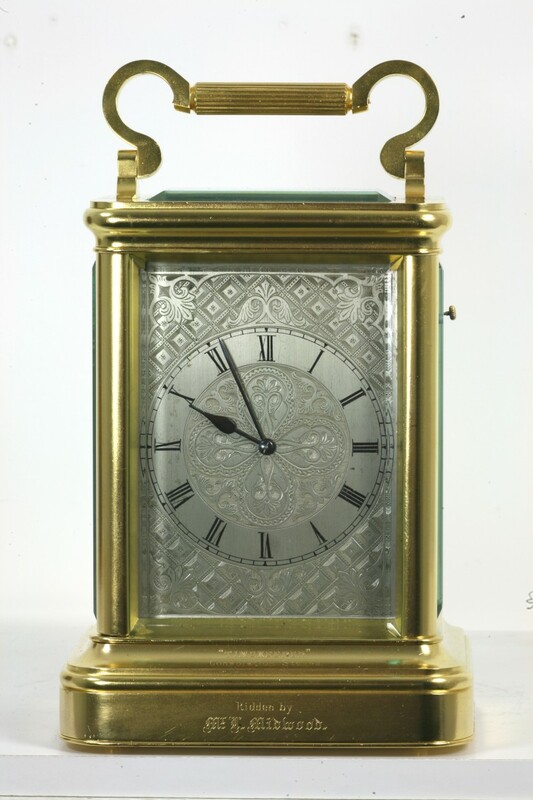 Although this clock is in exactly the same style as clocks produced by the great British makers from about 1850, we have dated it to 1890 because of the provenance below. 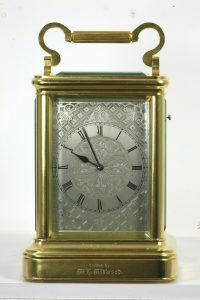 It is however possible that it is an English carriage clock made earlier, but bought and retailed second hand by Falconer in the 1890’s. 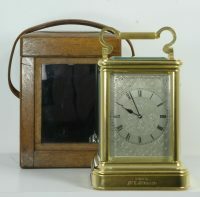 The clock has provenance dating from 1893 at the time of the Hong Kong Jockey Club races. 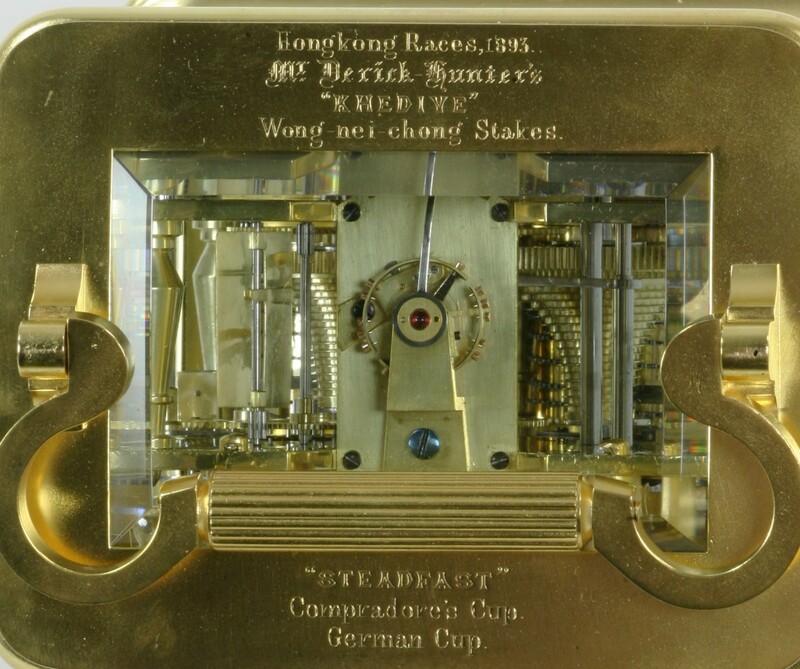 The top of the clock is engraved ‘Hong Kong Races 1893. Derek Hunter’s ′‘Khedive’ Wong-Nei- Chong.’ It also has ‘‘Steadfast’ Compradore’s Cup. German Cup’ and on the front at the bottom ‘‘Timekeeper’ Consolation Stakes ridden by Mr R Midwood’. The clock was presented to Mr R Midwood, who rode all of the horses which were all owned by Mr Hunter. It passed by descent to a cousin, James Midwood, who owned it until 2012 when it was sold to Campbell & Archard Ltd and then to Mr Jeremy Taylor.